The program for the Music in the Mountains Youth Orchestra will include three selections from Peter Tchaikovsky’s Nutcracker ballet. The Music in the Mountains Youth Orchestra will ring in the holiday season with familiar music from the Nutcracker, the Messiah and more this evening at 7 p.m. The concert will be held in the Amaral Center at the Fairgrounds in Grass Valley. The program includes three selections from Peter Tchaikovsky’s Nutcracker ballet: “The Nutcracker March,” invoking the opening party scene; the energetic Trepak or Russian Dance; and the amusing Mother Ginger, portrayed in the ballet by a hefty woman who glides on stage wearing an enormous hoop skirt, slowly revealing eight children hidden beneath. The program will close out with the music of Felix Mendelssohn; excerpts from two of his major compositions. First, an orchestration of the Finale of his well-known Octet, a suitable piece for a youth orchestra since it was composed when Mendelssohn was just 16. And then, as the pièce de résistance, 9-year old violinist Amaryn Olmeda, who has dazzled local audiences in the past, will be the soloist with the orchestra for a performance of the melodious first movement of the Violin Concerto in E minor. Music in the Mountains Youth Orchestra is comprised of young musicians ranging from late elementary through high school age. Officially founded in 2016, the orchestra began with mainly strings, but soon added brass and woodwinds to the mixture. 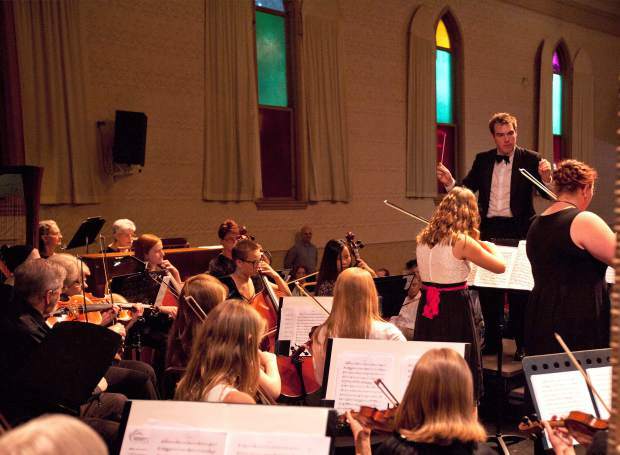 Ably led by conductor Wayland Whitney, Music in the Mountains Youth Orchestra made its debut to the public at large last December, and played to a packed hall during both its Tales from Vienna Woods concert in March and its Carnival of the Animals concert in May. Tickets for the concert, $10 for adults and free for students under 18, will be available this evening at the door of the Amaral Center. For more information, go to the website at musicinthemountains.org or call the Music in the Mountains box office at 530-265-6124.